Η χρήση του φθορισμού των ακτινών Χ για τον μη καταστροφικό προσδιορισμό της σύστασης των υλικών είναι γνωστή εδώ και χρόνια. Η OLYMPUS είναι η πρώτη εταιρεία που κατάφερε να αναπτύξει Φορητούς Αναλυτές XRF μικρού μεγέθους και να μπορέσει να προσφέρει την συγκεκριμένη μέθοδο στο ευρύ κοινό. Η Σειρά DELTA της OLYMPUS μπορεί να καλύψει πλήθος εφαρμογών στην Βιομηχανία, την Αρχαιομετρία, την ‘Έρευνα και την Ασφάλεια. The DELTA Premium is equipped for powerful performance to handle the most analytically demanding applications. Professional The DELTA Professional provides the best value solution with superior performance in speed, LODs, and elemental range. The DELTA Classic Plus provides quick ID, screening, sorting and elemental metals analysis for a large variety of applications. DELTA analyzers are ideal for the jewelry industry, museums, archaeological sites, pawn shops, coin collectors, cash-for-gold operations, scrap recycling, and more. 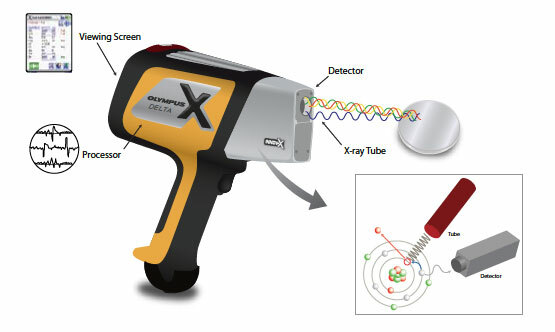 DELTA Lead Based Paint Handheld XRF Analyzers test for Lead (Pb) in seconds. These reliable, tube-based units are light in weight and ergonomically designed for all-day testing. They start fast and stay fast - no isotope fade. And, they have a low total cost of ownership. Before you begin structural repair - grinding, cutting or painting - screen for Pb; then, check your work area after clean-up. The Handheld XRF configured specifically for Industrial Lead-Based-Paint analysis is the DELTA Classic and is referred to as the DC4000LP. The DELTA does not have a HUD PCS; therefore, it is not suitable for HUD LBP applications. The Flex Stand for DELTA Handheld XRF Analyzers is a lightweight mobile test stand with a shielded sample chamber for use in benchtop and field testing. The Flex Stand is configurable for use with any DELTA Handheld XRF Analyzer in either horizontal or vertical orientation. This new cost-effective accessory features a compact, simple and hands-free method for testing small samples, standard size sample cups, and bagged samples. In the horizontal configuration, the DELTA’s touch screen user interface is accessible, eliminating the need for a computer. The sample is positioned in the chamber with an adjustable platform and secured with a groove and/or three-position ramp. In the vertical configuration, the chamber securely attaches to the top of the analyzer which allows the sample to rest on of the analyzer’s measurement window. The sample chamber support stanchions tuck neatly into the underside of the base for storage. The base accommodates the use of the DELTA’s optional AC battery adapter. The DELTA XRF analyzer is secured to the test chamber with a simple push-and-click motion and is easily released with a convenient bar pull. The test chamber is made of tungsten impregnated plastic with a magnetic closure and is fully shielded so that during testing, the x-ray radiation levels are below 0.1 mREM (1µSv). The portable Flex Stand is non-interlocked and is recommended for use with 40kV DELTA XRF analyzers.